From the early days of developing nuclear weapons is was evident that one of the side effects of the blast was an extreme flash effect, so strong that the human eye would be severely affected without protection. The initial thermal pulse from a nuclear blast can cause eye injuries in the forms of flash blindness and retinal scarring. Flash blindness is caused by the initial brilliant flash of light produced by the nuclear detonation. This flash swamps the retina, bleaching out the visual pigments and producing temporary blindness. During daylight hours, this temporary effect may last for about 2 minutes. At night, with the pupil dilated for dark adaptation, flash blindness will affect personnel at greater ranges and for greater durations. Partial recovery can be expected in 3 to 10 minutes, though it may require 15 to 35 minutes for full night adaptation recovery. Retinal scarring is the permanent damage from a retinal burn. It will occur only when the fireball is actually in the individual's field of view and should be a relatively uncommon injury. It is easy to imagine how disruptive temporary blindness would be to an aircrew operating in a complex hostile environment . 10 minutes is an extremely long time not being able to see your instruments or operate your weapons systems, and even two minutes is a long time, especially if you are in the middle of a high-speed low level penetration flight. The need for protection is therefore evident. The only means of protection initially was a very dark visor combined with a monocular eye shield - an eye patch much like the ones we habitually associate with pirates and buccaneers. Later it was discovered that the protective capacity of the visor could be enhanced by applying a very thin layer of gold to the visor lens. The gold layer reduced the light transmittance of the visor to only 2 percent compared to approximately 15% for a standard neutral visor depending on type. The same sort of gold layer was applied also to astronauts helmets to protect them from the damaging ultraviolet rays in the 200 to 300 millimicrons range. Needless to say the gold-plated visor lenses were very expensive. It therefore turned out to be less practical to install them for daily use where they would be easily scratched. An alternative to the gold-plated visor was developed in the form of a gold-plated lens for the well-known B-8 or M-1944 goggles. These could be worn when needed and otherwise tucked away in their protective box. The flash blindness goggle kit (MIL-G-635) consists of one container, one complete pair of goggles, one KMU-219/P modification kit (a rubber strap), and one monocular eye shield. According to PACAF regulations MIL-G-635 goggle kits are used in multiplace aircraft where they are stored on board and distributed as required, or they are used in fighter aircraft where the PLZT goggles are too large and cumbersome. It should be noted that the military specification is titled "MIL-G-635 Goggles, Sun, Wind And Dust". It does not say anything about the gold-plated visor lens. The MIL-G-635 is therefore only an identification of the frame used in the goggle kit, not a designation of the kit itself. Federal Stock Number of the goggles is 8475-00-133-3740, and the eye shield is FSN 8475-00-175-5323. Several attempts were made over time to produce a more sophisticated form of flash protection than just a gold-plated visor. One such attempt was the electrooptical goggle under development in the early 1960s. The goggle used dual lenses in each eye piece, one fixed and one movable. Vertical metallic bars were deposited on each lens. In the open state the bars of the moving lense were superimposed with the bars of the fixed lens. In operation, the rise time of a high intensity light source was detected by a photocell which activated a small propellant piston motor which forced the moving lenses to translate such that the opaque bars now were superimposed with the clear spaces of the fixed lens. 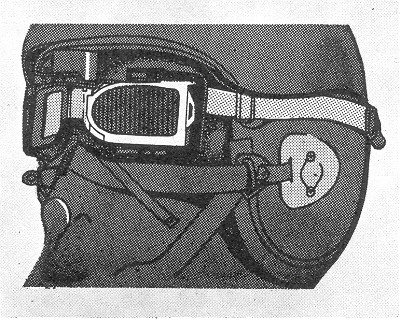 The goggle was completely self-contained and would operate four times without replacement of motors. The object was for the goggle to close within 500 microseconds and block 99.99 percent of the light transmission. AF Manual 64-4 does not say why the goggle did not pass the developmental stage but the field is open for anyone to guess. There is no doubt that it must have been difficult to guarantee that the physical movement of the lenses could meet the 500 microsecond target and it is also questionable how storage would affect the goggle. 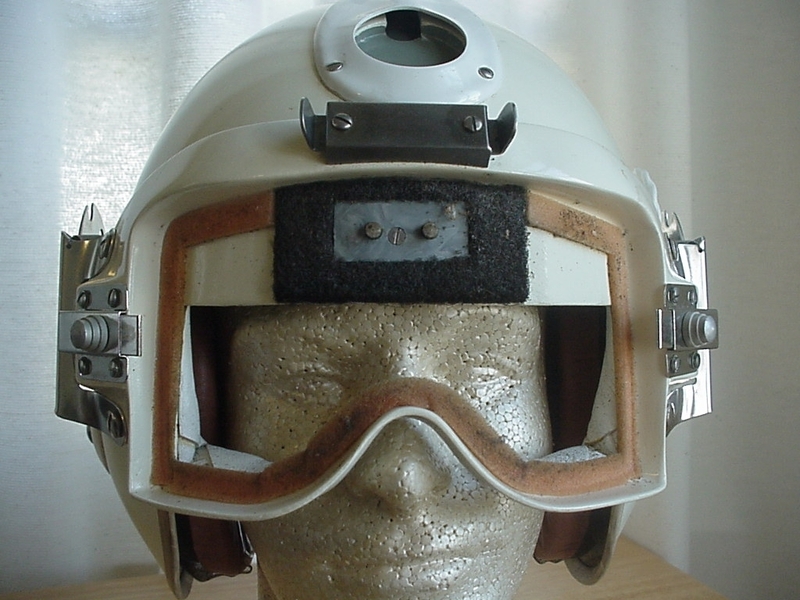 The electrooptical goggle under development by 1964. Another nuclear flash protection system was developed for the US Navy in the early 1960s, the DH-101. The DH-101 was manufactured by Omnitech Incorporated (later Gentex Optics) and was based on a standard APH-6 shell.The DH-101 is a nuclear flash protective helmet assembly manufactured in two sizes, medium (DH-101B) and large (DH-101A). Judging from the helmet designation, the helmet shell was manufactured by Gentex Corporation. 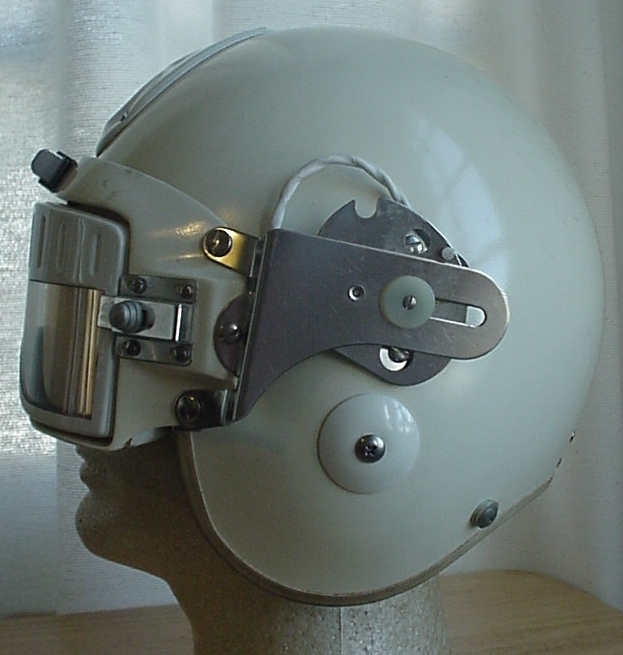 The DH-101 was used by the Navy as an experimental nuclear protective helmet. At least one of these helmets is dated 1964 with the removable glass part of the goggles being dated 1963. The glass part of the goggles are double paned glass with a air space in the middle. The goggles are removable by pushing the silver knobs on each side. Apparently DH-101 helmets were ordered under two contracts, N156-46680 was for the procurement of training helmets (the ones with black cord and tube), and N156-42471 for the procurement of operational helmets (the ones with two white braided cords). It looks as if the system was never fielded operationally in the fleet. US Navy A-6 and A-7 aircraft were equipped with a radiation protection system consisting of one fixed and three movable fiber glass segments, which enclosed the entire cockpit viewing area when extended. 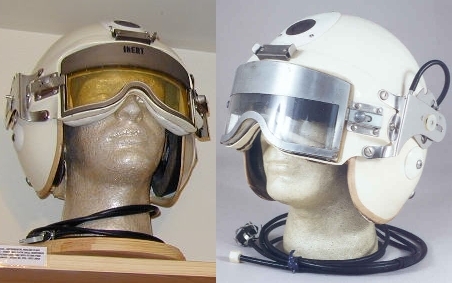 They were meant to be activated by the nuclear flash sensor on the DH-101 helmet. 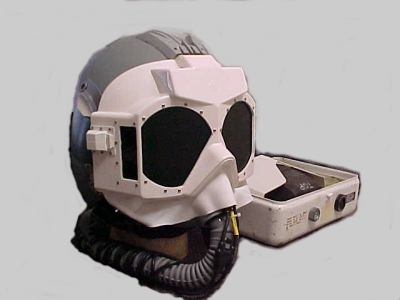 For special weapons missions in the A-7, the pilot's helmet was equipped with a flash-blindness protective (ELF) lens. When the nuclear flash sensor that closes the radiation panels was activated, a current was also directed to detonate a very small explosive charge contained in the lens. The exploding charge released a light-blocking graphite suspension to the inner core of the lens to protect the pilot's eyes from thermal flash while the closure panels were extending. When protected by the closure panels he would change the lens. The ELF lenses were normally stored in containers on the ejection seat in the cockpit when not in use. Three types of lenses have been identified. One is the operational lens with an explosive charge, one is the air pressure-operated training lens, and one is an inert lens modified from a live lens but without charges (MichaelFox' lens has the contact points from an operational lens but a hole has been drilled to allow fitting to a training helmet with air tube). The inert lens may have been used purely for training the correct handling and changing of lenses or for display purposes. The most advanced thermal flash protective devices in use are the PLZT goggles. These goggles are made of sandwich composite of polarized glass with an inner layer of a transparent electro-optic ceramic called PLZT. When linked to an electric current, the lenses are clear. But any dangerous flash of light, such as lightning or a nuclear blast, instantaneously breaks the circuit. This causes the lenses to go black, protecting the vision of anyone wearing the helmet. The designers of the PLZT goggle had found that the material could be discharged quicker than when charged to change the transmittance. Unfortunately, in order to obtain the desired switching speed, this meant that when the nuclear flash protective goggle failed, it was basically opaque. PLZT is a ceramic material consisting of lead, lanthanum, zirconate, and titante and it can be electronically switched rapidly in polarity, such that when sandwiched with a near infrared blocking material and a fixed polarizing material, the visual transmittance can be varied from full open state (approximately 20%) to totally opaque within a ten-millionth of a second. The protection device ( helmet-mounted special goggles containing four lenses) was developed under a $7.2 million contract managed by Aeronautical Systems Division at Wright-Patterson AFB, Ohio. The requirements for the goggles was orchestrated by Cal Crochet, SAC Life Support System program manager, who was the direct interface with Sandia Laboratories at Kirtland AFB, NM. 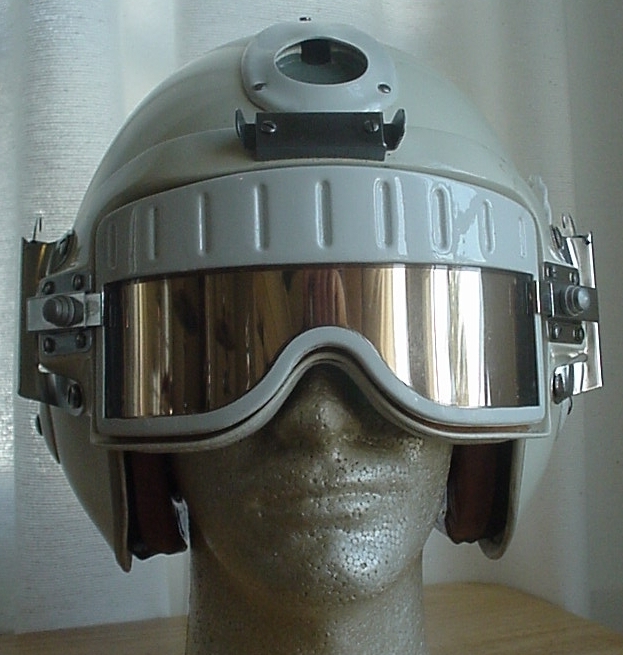 The idea for the goggles came from Cal's experience during his early days of flying helicopter (1957) at Eniwetok Atoll during nuclear tests under "Operation Hardtack" and later from his experiences with the flash curtain, gold goggles and eye patch problems encountered as a SAC B-47 and B-52 aircraft commander with the 306th and 509th Bomb Wings. The PLZT material was developed by two engineers, Gene Haertling and Cecil Land, from the Sandia National Laboratories in New Mexico from 1961 to 1973 (U.S. Patent No. 3,666,666, May 30, 1972, "Ferroelectric Ceramic Materials"). What initially was a visor lens for B-52 pilots was later refined into glass that fit entirely within the viewing ports of an airplane cockpit, with 6-in. diameter shutters in the viewing windows. The original PLZT goggles, military designation EEU-2/P, were developed for nuclear bombers such as the B-52 and B-1 in the Strategic Air Command (SAC), where the crewmembers would hopefully be just outside the blast, radiation, and/or heat damage radii of the weapon. A later version was designated EEU-2A/P, the difference between them being that the EEU-2A/P changes to dark faster than the EEU-2/P. By 2003 Thermal Flash Protective Devices (TFPD) were required for all PACAF aircrews on SIOP missions. 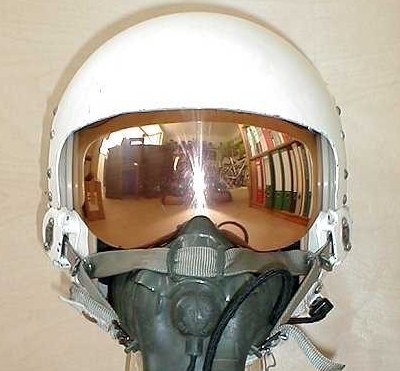 Either the MIL-G-635 or PLZT goggles at the wing commanders discretion would satisfy requirements for TFPD. On aircraft that were PLZT modified, it was recommended that the PLZT goggles be used. The EEU-2/P was first put in operational use in FB-111A aircraft. The first production goggles were delivered to Chanute AFB, Ill. for the training and maintenance personnel. In early fiscal year 80, SAC FB-111 aircraft at Pease AFB, NH and Plattsburgh AFB, NY did undergo cockpit modifications to accommodate the power pack of the thermal flash blindness protection device. The lenses are energized by low amperage 28 volt DC current. 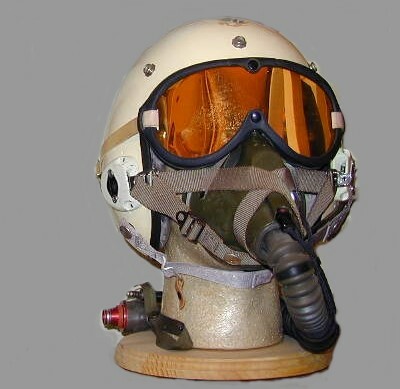 The goggles first arrived on July 23, 1980 at Pease AFB after specified modification to the FB-111A, aircrew helmets and oxygen masks had been completed. When the goggles became operational, the 509th BMW set two firsts as alert aircrew Maj.Jack Pledger and Capt.William Rauschenbach, respectively pilot and navigator with the 393rd BS, became the world's first aircrew to be equipped with the new goggles while on alert status with FB-111A 68-0252. Soon after, the entire alert force of the 509th had achieved initial operating capabilities with the new flash blindness goggles. Each alert aircraft was fitted with two sets of goggles. The goggles were affixed to the helmets by the individual aircrew members when their use was required. To get them in place, a crew member had 20 seconds to pick them up, raise them over head and while holding them out horizontally, slide them down the front of the helmet onto the connections and then snap the protective devises on. The PLTZ goggles were sealed in plastic inside a canvas bag that was attached with velcro under the glare shield in front of the Terrain Following Radar (TFR) scope. 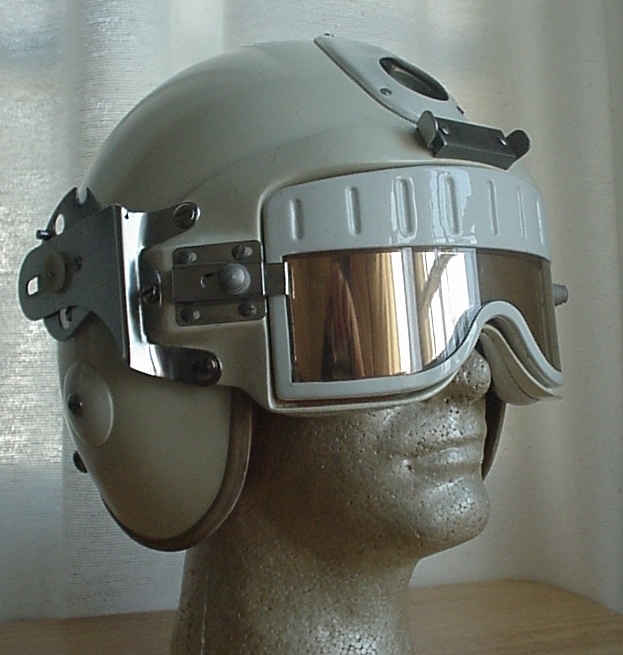 Tests in 1978 revealed that while tactical fighters could also deliver smaller nuclear weapons, use of the PLZT goggles in fighter aircraft was not favourable, due to the weight and visual transmittance. Also, the tactical fighters would probably have delivered the weapons in the daytime during this era and the effects of temporary flash blindness in the daytime would be minimal for the smaller nuclear weapons. 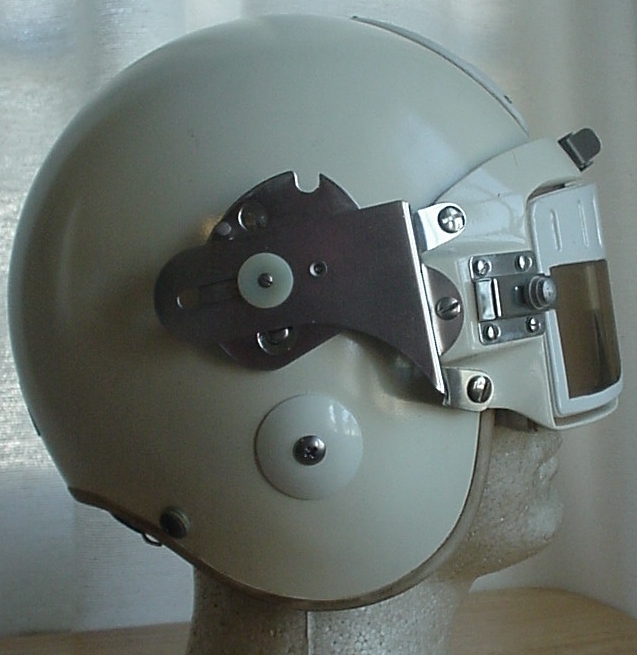 US Army Aviation Research Laboratories (USAARL) evaluated a nuclear flash blindness protective device with the initial development of the HGU-56/P helmet program in the early 1980's. Among other things they found that the PLZT electronics, which detected a certain increase in ambient luminance in approximately 4 microseconds, could be accidentally activated by the rotor blades and when near a radar station. However, the real problem with the nuclear flash blindness protective device requirement is the concept for helicopter operations. In the European scenario with a tactical nuclear war with the former Warsaw pact, the very basic unclassified war game models showed that the only helicopters that could survive were the ones hidden in bunkers. Therefore, it did not make sense to use a nuclear flash blindness protective device for Air Warrior or Army aviation with the known technology.